...ages ago from one of our many informants in the high end real estate scene in Beverly Hills that Oscar winning actress Reese Witherspoon–who just received a well-deserved star on the Hollywood Walk of Fame–was on the hunt for a new house to call home in Los Angeles. Since late 2003, when she was still married to actor Ryan Phillippe who is making real estate news of his own, she has owned and occupied a 6,956 square foot house with 6 bedrooms and 9 poopers in the Brentwood area of Los Angeles. It was in this residence where actor Jake Gyllenhaal all but lived with Miz Witherspoon before their romance swirled down the terlit of love and he hooked up with budding superstar singer/actress Taylor Swift. Miz Witherspoon has moved on to Hollywood agent to the stars Jim Toth. Anyhoo, late last night will settin' around waiting for the gin & tonic and Xanax to reach that critical mass of goodness and light, we received a very thoughtful missive from the Bizzy Boys at Celebrity Address Aerial who tattled that Miz Witherspoon has indeed snatched up a new house, paying $6,900,000 in late August of 2010 for a privately situated estate in the Mandeville Canyon area of Los Angeles not so far from Governator Arnold Schwarzenegger's mansion and the massive mock Mediterranean pile that supermodel/media mogul Heidi Klum and Grammy winning musician Seal are rumored and reported to be in the process of purchasing. Naturally, Your Mama did our own little peep and poke around the property records and although Miz Witherspoon's name appears nowhere on any of the online documentation we dug up we did discover that the horse friendly estate was purchased through a trust with the exact same name and trustee as other properties known to be in Miz Witherspoon's real estate portfolio. Make of that what y'all will. Miz Witherspoon acquired the 2.53 acre estate from the incredibly bizarre actor/producer/musician/writer/martial artist/reality tee-vee star Steven Seagal who sometimes goes by the names Chungdrag Dorje and Takeshigemichi, who currently serves as a Reserve Deputy Chief of the Sheriff's Office in Jefferson Parish, LA and who has seven children and 4 baby mommas. Your Mama can only hope that Miz Witherspoon and her people have been all up in there burning sage and doing whatever else they can to clear out every nook and cranny of the house that might have a lick of bad ju-ju left over from its previous occupant. There are other online resources that connect both Jerry Seinfeld and mucho mustachioed actor Tom Selleck to the property but we can't seem to sort out whether these alleged connections have a pea pod of veracity. 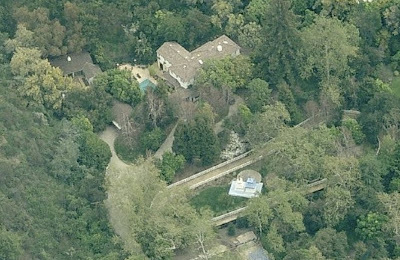 The property does not appear to have been on the open market but according to the Los Angeles County Tax man the main house was erected in 1937 and measures 6,125 square feet with 7 bedrooms and 9 poopers. Also on the property detached garages, stables, a riding ring and swimming pool. Miz Witherspoon, one of the highest paid and most powerful actresses working in Tinseltown today, also owns homes in her native Nashville, TN and a stunning Wallace Neff designed Spanish Colonial style compound in the sophisticated and semi-rural outpost of Ojai, CA. Thanks Mama for giving Seal a proper title. You're a star. Steven Seagal has 7 children with 4 baby mommas? Oh, my. I don't think it is any secret that her present abode is on N. Gunston Drive. It is a corner lot filled almost to the edges with house. Hardly any yard. And she is protected only by a closed off street. I would guess now that her kids are growing up she wants more space for them, and maybe some horses or whatever. I doubt she is still being paid 20 million a picture, although I can't say anything for a fact. I saw that she got only 10 million for a recent piece of work, although that may be just a rumor. Tangential comment re Gyllenhaal. He seems to save money by moving in with girl friends. I believe he lived in Dunst's house when he was "dating" her and then when his affair with Witherspoon began he soon after moved in with her. I wonder if he is planning to move into Taylor Swift's house. I think he has a home, maybe, of sorts in the Hills, but it is probably small and cheap and just to have some place to stay temporarily when and if he is kicked out of better digs. Yet another one for Reese, eh? Re Ryan: according to Box Office Mojo his last two pictures have lost money. His house (bought I suspect with his divorce settlement) may be too expensive for him to afford. The baby faced actor doesn't seem to have much clout in Tinsel Town. That funny little structure in the bottom part of the picture would appear to be a minature Buddhist temple. It lacks a Bo tree however so cannot be considered complete. re: anonymous. The little structure at the bottom of the picture is in the center of a horse ring. I imagine it is some sort of viewing grandstand. Better pictures here and the Daily Mail says it's a Buddhist Temple, minature.